I had the pleasure tonight of meeting David Petersen, creator, writer and artist of Mouse Guard, Fall 1152, at our monthly graphic novel discussion group. He proved to be very nice and funny, taking time to answer everyone's questions and telling us a little history on the background and development of the Mouse Guard storyline, as well as some tidbits on the future of the series. Afterward, he took the time to talk to each of us while he signed our books (and sketched in them too!). I thought that was very generous that he gave each of us a sketch of a mouse in our editions. I imagine that must be a little daunting sometimes to come up with an original drawing on the spot like that, but he did it all the same! It was also very generous of him to give up his time like that, because from the way it sounded, he's got quite the work load right now trying to get artwork completed for an RPG that is in the works based on Mouse Guard. 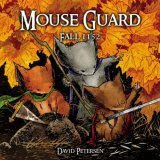 To be honest, the only reason I picked up David Petersen's Mouse Guard, Fall 1152 originally is because I've read the Redwall series by Brian Jacques for years, and since this dealt with mice as well, I thought that I'd give it a try. Happily, I wasn't disappointed. Originally published as 6 separate comics, I initially felt that the story was played out better in that serial format. On my first reading of the collected edition, there didn't seem to be too much meat to the actual story. I thought that the collected edition actually hampered the story-telling process, as each individual issue would have had a month or 2 break to whet the appetites of those reading for the next installment. However, as I've gone back on several more occasions to revisit the lands of Mouse Guard, I can honestly say that the story has grown on me, and I can see the subtleties both in Petersen's story as well as his artwork. The artwork on Mouse Guard Fall 1152 is stunning. Handling all art chores himself, Petersen has created a beautifully rendered and colored world, with an almost hand-painted yet organic feel to the entire story. I hope that the next time he's around the area, I will be able to meet up with him again. Thanks again, David, for a great evening.